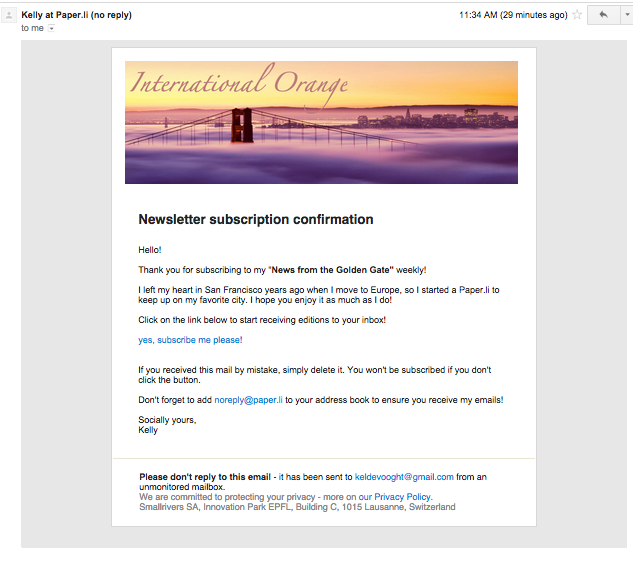 If you’re on our Pro package, your subscription confirmation and subscription confirmation success emails will now carry the banner of your paper. In addition you have the opportunity to customize the text in your confirmation emails as well. Below I’ve created a few examples to show you the difference. 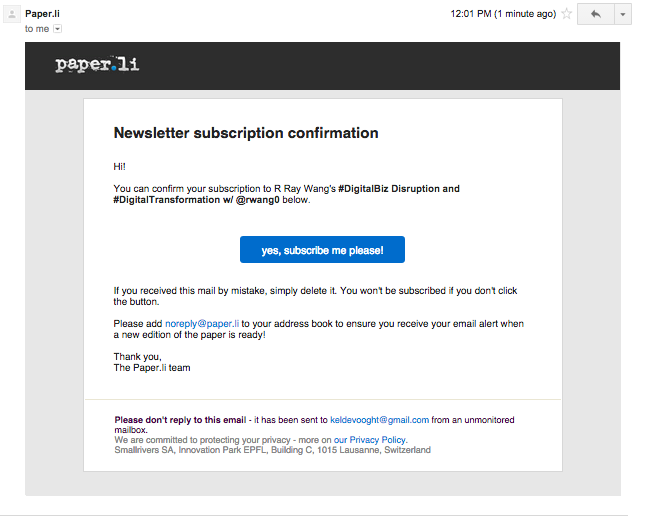 This is what the Paper.li basic Subscription Confirmation email looks like. It is sent out when someone subscribes to your paper. Thought leader and Social Business innovator R. Ray Wang publishes under our basic package. Excellent content, excellent topics. Subscribe to one here. Michele Lorito-Chase is a Pro publisher and her Co-Learning Spaces is an incredible paper. Subscribe here. Pretty nice, right? You can go one step further and customize the body of the text, too. Left your heart in San Francisco? Subscribe to my International Orange. I hand pick my favorite articles weekly. 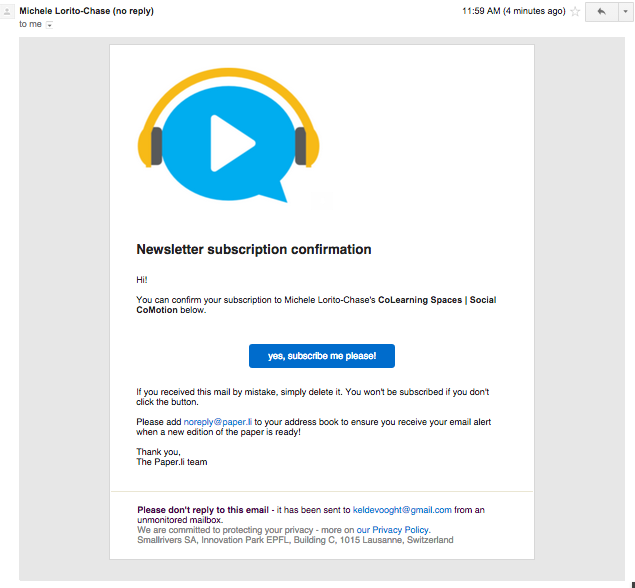 These customizations go for the Confirmation Success email we send out when your subscriber has opted-in to receiving updates from you. If you aren’t yet publishing under a Pro package, you’ll need to upgrade first. Simply sign-in and and click on our Upgrade to Pro button. Once you have upgraded, go to Look & Feel under the Appearance and Layout tab to add a banner to your Paper.li. Your banner will be automatically carried over to your Subscription Confirmation templates. To customize the body of your Subscription Confirmation and Confirmation Success emails, go your Email and Promotions tab. While we were at it, we did a little housekeeping and moved the Newspaper Embeds and Auto-Redirect to the Email and Promotions tab. You can read all about these change here!